Pranav Dhyanchand, a 6 year young boy suffering from a rare genetic disorder i.e x-linked Andrenoleukodystrophy. The condition mainly affects the nervous system and the adrenal glands (small glands located on top of each kidney). He already lost his younger brother Nehanth Dhyanchand of 3 years with the same genetic disorder. 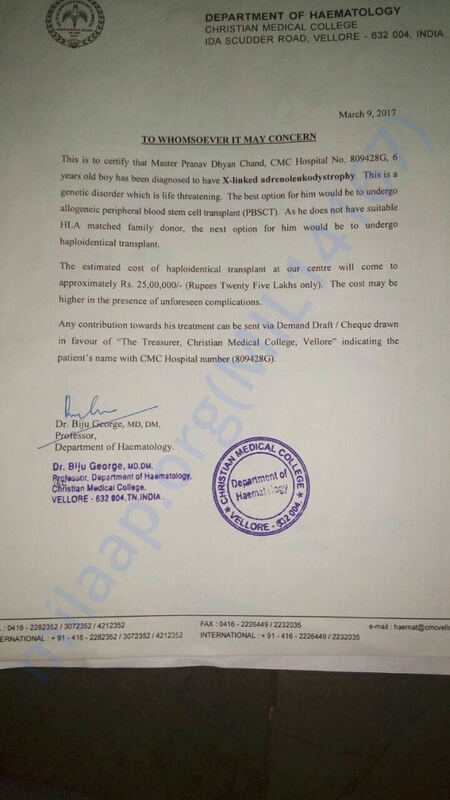 This operation costs 25 lakh indian rupees (40000 USD) to perform "Peripheral Blood Stem Cells transplant(PBSCT)/Bone Marrow Transplantation(BMT)" and Pranav's parents could not affort this amount. He is alreay in second stage of the disease and which is affecting his brain and body. He started losing his voice and could not walk properly. Pranav and Nehanth are just like every other kid playing everyday, going to school and healthy until one day when Nehanth became so ill and his parents thought it's just a high fever but unfortunately they had to lose Nehanth just in a week and they were in total shock. Some days passed, now Pranav, the elder one started behaving abnormal and became ill just like Nehanth. Parents took him to hospital where he was diagnosed with this rare disease. This disease is similar to a type of blood related cancer which is curable by transplanting blood stem cells. 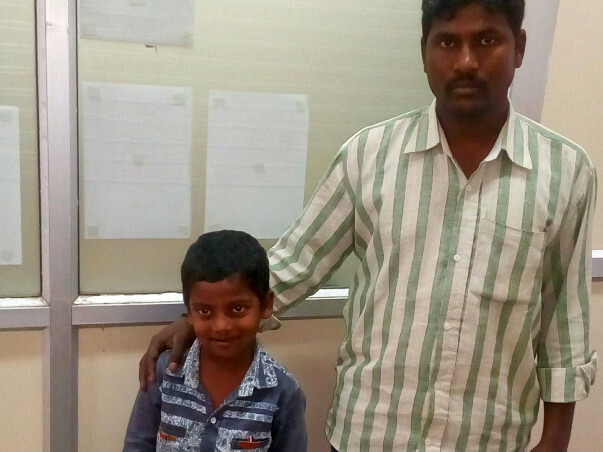 Srinivas, the father of Pranav Dhyanachand is a very good person, I know him personally. He runs a tent house in his village near keshampet, Shadnagar, Telangana and earns money by renting tent/other items for marriages and small parties which is sufficient for the family needs. This huge amount of 25 Lakhs is something that he cant even think of in his whole lifetime. 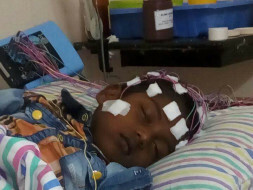 Pranav has been taken to many hospitals like Basava Tharaka in Hyderabad, KIMS Hyderabad, CMC Vellore and Gandhi Hospital Hyderabad for medical tests and everywhere, the result was same that the boy has genetic disorder and the minimum cost of the operation is INR 2500000 (40000 USD) and it may go upto INR 3000000. 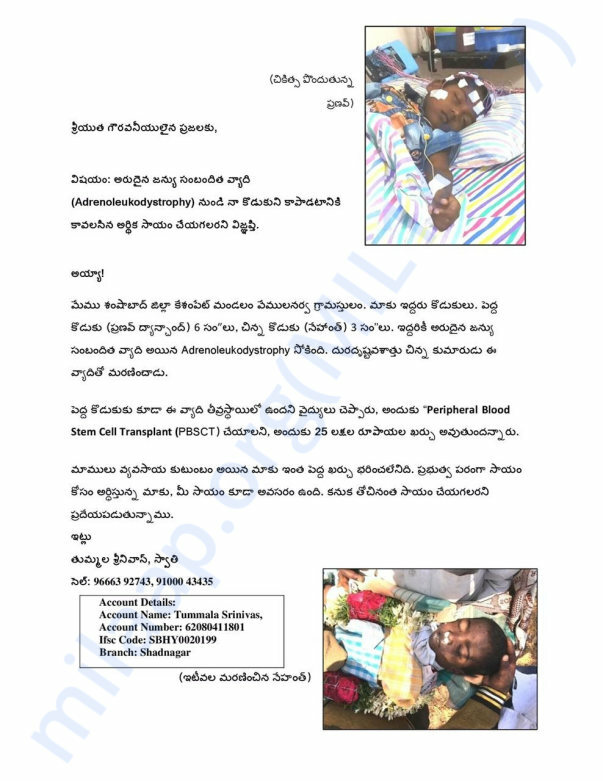 We friends have already collected an amount of 1.5 lakh(2300 USD) and sent to Srinivas account. They are currently using it for the pre medical expenses. 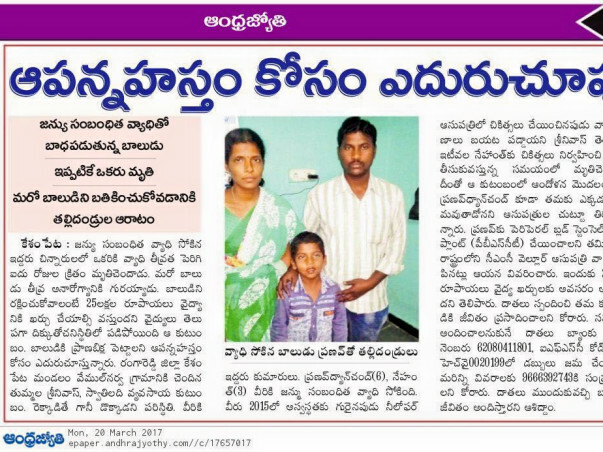 I kindly request all of you to extend your help in saving this child and give him a new life. I will attach all the documents and you can contact me or call srinivas if you need any other information. PLEASE HELP!!!! Thanks to all for hearty contributions. We have an update to share on Pranav's health. Currently, Pranav is in serious condition, he could not breathe properly. So he was taken to Niloufer Hospital. He will need your prayers and support to survive. Thanks very much for your donation and really much appreciated. I kindly request you to SHARE this post on your facebook, Twitter or any other social media and ALSO, please ask atleast 3-5 of your friends to share this. It helps us in getting this post to reach someone who can help, just like you. 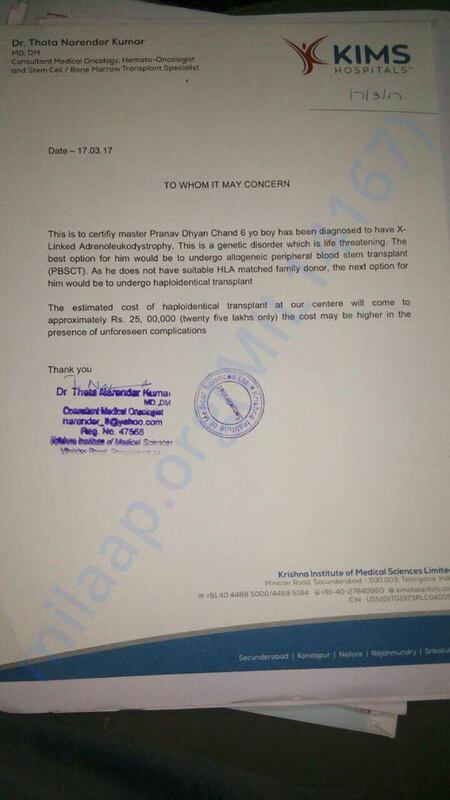 Pranav's condition is getting a bit serious and hospitals are asking for atleast 10 lakhs to start the actual treatment. Currently they don't have that much amount and all they depend on is this fundraiser. If someone can get the direct help from the Government , NGOs, organizations etc. kindly please proceed. ~"We can't help everyone, but everyone can help someone"
Praying for your soon recovery.